1. The District Consumer Forum as a Consumer – if there is a case where the bank has committed any deficiency of service and negligence prima facie on part of the Bank. 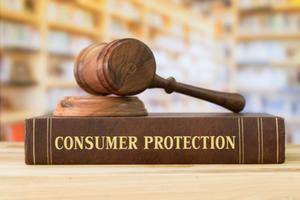 The Consumer Protection Act, 1986 (In short,‘The Act’) is a benevolent social legislation that lays down the rights of the consumers and provides their for promotion and protection of the rights of the consumers. The first and the only Act of its kind in India, it has enabled ordinary consumers to secure less expensive and often speedy redressal of their grievances. By spelling out the rights and remedies of the consumers in a market so far dominated by organized manufacturers and traders of goods and providers of various types of services, the Act makes the dictum, caveat emptor (‘Buyer Beware’) a thing of the past. To provide inexpensive, speedy and summary redressal of consumer disputes, quasi-judicial bodies have been set up in each District and State and at the National level, called the District Forums, the State Consumer Disputes Redressal Commissions and the National Consumer Disputes Redressal Commission respectively. At present, there are 629 District Forums and 35 State Commissions with the National Consumer Disputes Redressal Commission (NCDRC) at the apex. NCDRC has its office at Upbhokta Naya Bhawan, 'F' Block, GPO Complex, INA, New Delhi-110 023. Each District Forum is headed by a person who is or has been or is eligible to be appointed as a District Judge and each State Commission is headed by a person who is or has been a Judge of High Court. The provisions of this Act cover ‘goods’ as well as ‘services’. The goods are those which are manufactured or produced and sold to consumers through wholesalers and retailers. The services are in the nature of transport, telephone, electricity, housing, banking, insurance, medical treatment, etc. A written complaint, can be filed before the District Consumer Forum for pecuniary value of upto Rupees twenty lakh, State Commission for value upto Rupees one crore and the National Commission for value above Rupees one crore, in respect of defects in goods and or deficiency in service. The service can be of any description and the illustrations given above are only indicative. However, no complaint can be filed for alleged deficiency in any service that is rendered free of charge or under a contract of personal service. The remedy under the Consumer Protection Act is an alternative in addition to that already available to the aggrieved persons/consumers by way of civil suit. In the complaint/appeal/petition submitted under the Act, a consumer is not required to pay any court fees but only a nominal fee. Consumer Fora proceedings are summary in nature. The endeavor is made to grant relief to the aggrieved consumer as quickly as in the quickest possible, keeping in mind the provisions of the Act which lay down time schedule for disposal of cases. If a consumer is not satisfied by the decision of a District Forum, he can appeal to the State Commission. Against the order of the State Commission a consumer can come to the National Commission. Functioning of District Forum, State Commission and National Commission is consumer friendly, and thus a consumer can file a complaint and also address arguments in person. In genuine cases where the complainant/ appellant/ petitioner before the National Commission is unable to engage the services of an advocate legal aid is provided by the Commission free of charge. Means right to be informed about the quality, quantity, potency, purity, standard and price of goods so as to protect the consumer against unfair trade practices. Consumer should insist on getting all the information about the product or service before making a choice or a decision. This will enable him to act wisely and responsibly and also enable him to desist from falling prey to high pressure selling techniques. Means right to seek redressal against unfair trade practices or unscrupulous exploitation of consumers. It also includes right to fair settlement of the genuine grievances of the consumer. Consumers must make complaint for their genuine grievances. Many a times their complaint may be of small value but its impact on the society as a whole may be very large. They can also take the help of consumer organisations in seeking redressal of their grievances. Means the right to acquire the knowledge and skill to be an informed consumer throughout life. Ignorance of consumers, particularly of rural consumers, is mainly responsible for their exploitation. They should know their rights and must exercise them. Only then real consumer protection can be achieved with success. To provide simple, speedy and inexpensive redressal of consumer disputes, the CPA envisages a 3-tier quasi-judicial machinery at the National, State and District levels. National Consumer Dispute Redressal Commission, known as National Commission, deals with complaints involving costs and compensation higher than Rs. One Crore. State Consumer Dispute Redressal Commission, known as State Commission, deals with complaints involving costs and compensation higher than Rs. Twenty Lakh and less than Rs. One Crore. District Consumer Dispute Redressal Forum, known as District Forum, deals with complaints involving costs and compensation less than Rs. Twenty Lakh. Consumers can file different types of complaints depending on their specific grievance by visiting the Consumer Court at the district, state or national level along with the documents required for filing the complaint. Following is a list of documents that the prospective complainants need to carry with them to the Consumer Court at the time of filing the complaint. 3. SUPPORTING DOCUMENTS IN FAVOUR OF THE COMPLAINT E.G. RECEIPT, VOUCHER ETC. Now you can get case status through SMS even if you don't have internet connection. The PULL SMS service allows you to request for and receive information about Next Hearing Date of the cases filled in NCDRC/State Commission/District Consumer Forum by sending SMS through your mobile. Case number should be case sensitive and match exactly as provided by consumer forum. Note:- For sending SMS, Charges will be applicaple as per your mobile network provider policy. Whenever your case gets new date the complainant, respondent and respective advocates will get an alert SMS from the confonet application subject to the availability of the contact details consumer have provided to the consumer forum. Whenever the your case gets new date the complainant, respondent and respective advocates will receive the order through E-mail from the confonet application subject to the availability of the email details consumer have provided to the consumer forum. Consumers are requested to provide updated email id and contact details to the consumer forum while filing the case. A person who buys any goods or services for a consideration which has been paid or promised or partly paid and partly promised or under any system of deferred payment is a Consumer. A person who obtains such goods for resale or for any commercial purposes will not be a consumer. However, if such goods are bought by a person exclusively for the purpose of earning his livelihood by means of self-employment then such a person will be considered as a consumer. IN THE PRESENT CASE, THE CONSUMER IS THE STUDENT WHO HAS TAKEN THE EDUCATIONAL LOAN AND THE BANK (INDUSTRY) IS THE ONE WHICH HAS BEEN NEGLIGENT AND DEFICIENT IN THEIR SERVICES WHILE DEALING WITH THE EDUCATIONAL LOAN. What are the functions of the Consumer Clubs in schools / colleges? · Monthly meetings and demonstrations for one hour after school hours on the First Thursday of each month. Each month a topic / activity may be scheduled as in the model calender. · Days of National and International importance to consumers may be celebrated in the School / College. Poster / Speech / Essay competitions can be organised at school level by the Consumer Club. · Field visits to local markets / Consumer Courts and door to door campaign in the local community etc., may be organized for atleast 4 days in a year. It can be done on Saturdays by prior arrangement. · Minutes of each activity have to be recorded by the Student and Teacher Co-ordinator jointly to document. · A Consumer Club notice board shall be opened to be updated daily by the teach and students with consumer related news. What are the steps to be taken by the consumers against defectiveness? On noticing the defectiveness of the commodity / service provided the consumer has to approach the concerned Commercial / Government organisation requesting for rectification / change of commodity / return back of money, in writing. (with acknowledgement) If the concerned organisation failed to take appropriate action, the District Collector shall legally initiate action. · one or more consumers representing numerous consumers having the same interest. When the complaints can be made? · Loss or damage is caused to the consumer due to unfair trade practice of a trader. · If the article purchased by a consumer is defective. · If the services availed of by a consumer suffer from any deficiency. · When the price paid by a consumer is in excess of the price displayed on the goods or when the price is in excess of the price fixed under any law in force. · Goods, which will be hazardous to life and safety, when used are being offered for sale to the public in contravention of the provisions of any law. What is District Consumer Protection Council? District Consumer Protection Council is the council constituted under Consumer Protection Act, 1986 for each district. District Collector acts as its Chairman, District Supply and Consumer Protection Officer as Member-Secretary, and all the M.P.s, M.L.A.s and officials of all Government Departments having Consumer interface of the Concerned District as members along with the VCOs functioning in the District. This Council shall meet twice in a year as per Consumer Protection Act, 1986. Representations given by the VCOs during the meetings. Where complaints can be registered? How to register the complaints? · Complaint can be registered within 2 years from the date on which the cause of action has arisen. · .Complaint can be registered, in person, by the complainant or through his authorised agent or by post addressed to the Redressal Agency. · Lawyers are not necessary. What are the particulars that should be furnished along with the complaint? · The details of complaint, whether it is against Unfair Trade Practice / supply of defective goods / deficiency in service provided / collection of excess price, should explicitly be mentioned in the complaint petition. · The relief sought for under this Act. · To remove the defects in the goods pointed out. · To replace the goods. · To pay such amount of compensation for the loss or injury suffered by the consumer. What is the appeal provision? · Aggrieved by the orders issued by the State Consumer Dispute Redressal Commission appeal petition may be filed before National Consumer Dispute Redressal Commission within 30 days from the date of receipt of orders. · No fee is charged for registering an appeal petition before State / National Consumer Dispute Redressal Commissions. · The appeal petition has to be filed with the grounds for appeal with copies of orders of the lower redressal agencies and registering procedures are same as is being done in the case of registering complaint. What are the Rights of Consumers as stipulated under Consumer Protection Act 1986. 9A. Fee for making complaints before District Forum - (1) Every complaint filed under sub-section (1) of section 12, sub-section (1) of section 17 and clause (a) in sub-clause (i) of section 21 of the Act shall be accompanied by a fee as specified in the table given below in the form of crossed Demand Draft drawn on a nationalised bank or through a crossed Indian Postal Order drawn in favour of the Registrar of the State Commission and payable at the respective place where the State Commission or the National Commission is situated. (2) The concerned authority referred to in sub-rule (1) shall credit the amount of fee received by it into the Consumer Welfare Fund of the respective State and where such fund is not established into the Receipt Account of the State Government and in the case of the National Commission, to the Consumer Welfare Fund of the Central Government. Upto one lakh rupees – For complainants other than AntyodayaAnna Yojana card holders. (3) The complainants who are under the Below Poverty Line shall be entitled for the exemption of payment of fee only on production of an attested copy of the Antyodaya Anna Yojana cards. (d) the Central Government or the State Government, as the case may be, either in its individual capacity or as a representative of interests of the consumers in general. (2) Every complaint filed under sub-section (1) shall be accompanied with such amount of fee and payable in such manner as may be prescribed. Provided further that the admissibility of the complaint shall ordinarily be decided within twenty-one days from the date on which the complaint was received. Provided that where a complaint has been admitted by the District Forum, it shall not be transferred to any other court or tribunal or any authority set up by or under any other law for the time being in force. Explanation. - For the purpose of this section “recognised consumer association” means any voluntary consumer association registered under the Companies Act, 1956 or any other law for the time being in force”. (g) the District Forum shall thereafter give a reasonable opportunity to the complainant as well as the opposite party of being heard as to the correctness or otherwise of the report made by the appro­priate laboratory and also as to the objection made in relation thereto under clause (/) and issue an appropriate order under section 14. (ii) ex parte on the basis of evidence brought to its notice by the complainant where the opposite party omits or fails to take any action to represent his case within the time given by the Forum. (c) where the complainant fails to appear on the date of hearing before the District Forum, the District Forum may either dismiss the complaint for default or decide it on merits. (3) No proceedings complying with the procedure laid down in sub­sections  and  shall be called in question in any court on the ground that the principles of natural justice have not been complied with. Provided further that the District Forum shall make such orders as to the costs occasioned by the adjournment as may be provided in the regulations made under this Act. Provided also that in the event of a complaint being disposed of after the period so specified, the District Forum shall record in writing, the reasons for the same at the time of disposing of the said complaint. (3B) Where during the pendency of any proceeding before the District Forum, it appears to it necessary, it may pass such interim order as is just and proper in the facts and circumstances of the case. (vi) any other matter which may be prescribed. (5) Every proceeding before the District Forum shall be deemed to be a judicial proceeding within the meaning of sections 193 and 228 of the Indian Code (45 of 1860), and the District Forum shall be deemed to be a civil court for the purposes of section 195, and Chapter XXVI of the Code of Criminal Procedure, 1973 (2 of 1974). (6) Where the complainant is a consumer referred to in sub-clause (iv) of clause (b) of sub-section (1) of section 2, the provisions of rule 8 of Order I of the First Schedule to the Code of Civil Procedure, 1908 (5 of 1908) shall apply subject to the modification that every reference therein to a suit or decree shall be construed as a reference to a complaint or the order of the District Forum thereon. (7) In the event of death of a complainant who is a consumer or of the opposite party against whom the complaint has been filed, the provisions of Order XXII of the First Schedule to the Code of Civil Procedure, 1908 (5 of 1908) shall apply subject to the modification that every reference therein to the plaintiff and the defendant shall be construed as reference to a complainant or the opposite party, as the case may be. (d) to pay such amount as may be awarded by it as compensation to the consumer for any loss or injury suffered by the consumer due to the negligence of the opposite party. (i) to provide for adequate costs to parties. Provided that where a member, for any reason, is unable to conduct a proceeding till it is completed, the President and the other member shall continue the proceeding from the stage at which it was last heard by the previous member. Provided that where the proceeding is conducted by the President and one member and they differ on any point or points, they shall state the point or points on which they differ and refer the same to the other member for hearing on such point or points and the opinion of the majority shall be the order of the District Forum. (3) Subject to the foregoing provisions, the procedure relating to the conduct of the meetings of the District Forum, its sittings and other matters shall be such as may be prescribed by the State Government. 28A. Service of notice, etc. - (1) All notices required by this Act to be served shall be served in the manner hereinafter mentioned in sub-section (2). (2) The service of notices may be made by delivering or transmitting a copy thereof by registered post acknowledgment due addressed to opposite party against whom complaint is made or to the complainant by speed post or by such courier service as are approved by the District Forum, the State Commission or the National Commission, as the case may be, or by any other means of transmission of documents (including FAX message). Provided that where the notice was properly addressed, pre-paid and duly sent by registered post acknowledgment due, a declaration referred to in this sub-section shall be made notwithstanding the fact that the acknowledgment has been lost or mislaid, or for any other reason, has not been received by the District Forum, the State Commission or the National Commission, as the case may be, within thirty days from the date of issue of notice. (4) All notices required to be served on an opposite party or to complainant shall be deemed to be sufficiently served, if addressed in the case of the opposite party to the place where business or profession is carried and in case of complainant, the place where such person actually and voluntarily resides. 1. The documents shall be filed in English language only or translated copy of any other language, duly typed in double space on one side of the paper. If any supporting documents are not legible the same will not be accepted until clear legible/photo copies are filed. 3. After the issue of notice, any documents in a case, the same has to be served on the other side and 1+1 sets (with File cover) be filed with proof of service. No document will be accepted unless filed two days (working days) in advance from the date of hearing. 4. Henceforth, the review petition/application for recalling of order will be listed before the bench by way of circulation in chambers. 5. The counsel or the parties appearing in person are filing a common petition / appeal against common order passed by the State Commission in a bunch of appeals / complaints. It causes inconvenience to the Hon’ble Benches to decide the independent issues pertaining to each matter, such as award of different amounts to different parties, etc. Hence, the Hon’ble President is pleased to direct the parties / Counsel to file independent or separate appeals/revision petitions, against each appeal/complaint decided by the State Commission in the common order. 6. No. of copies to be filed in the Commission 1+1 sets (with File cover) + Number of Opposite Parties. 7. Application for Certified copy of order must be made on Letter Head with signature & Rubber stamp by counsel with a statement that first free certified copy has not been received either by the party-in-person or their counsel. 8. Duplicate certified copy shall be issued on payment basis as per Regulation with a clear endorsement that earlier first free certified copy was sent by post at the address of the party-in-person or to their Counsel/Authorized Representative.